When it comes to choosing an online bingo site there are many different factors to consider and one of those is the choice of bingo rooms that a brand has. As bingo players, we are all individuals and as such, each have different expectations and requirements from the site we choose to frequent. When it comes to the term ‘bingo rooms’, there are many different connotations and here we look at the different types across a multitude of different networks and software platforms. The general definition of ‘bingo rooms’ would be the venue where you actually participate in the game. From the Newbie room offered by some sites as an introduction to their site, to the free bingo rooms that are available from some operators as a taster to the brand and the gaming experience that they have to offer. You will also find that there are themed bingo rooms, special rooms only available to VIPs and at some sites, private rooms. Different bingo rooms are offered to cater for the multitude of individual players that a site will have. A great place to start is the newbie bingo rooms and access to these rooms varies from site to site that offer them. Newbie rooms are usually rooms that are only open for a limited time to the player who has recently registered and / or deposited at a specific site. The newbie room at Mecca bingo offers players access to a free play room for seven days from the point of registration and no deposit is required. There are two sessions daily, one from midday until 1pm and then another in the evening from 6pm until 8pm. Each game of the games offer a £20 bingo bonus and are community jackpots which means even if you don’t win, you could take a share of the prize money offered. There are two different newbie rooms at Mecca Bingo and your access is determined by the day that you register with the site. The newbie room at Film bingo offers a free game of bingo every few minutes from 8pm until 11pm daily. Access to the room is given when you make you first deposit with the site and is available for seven days from the point of your first transaction. The room boasts 90 ball games only and each has a jackpot of £3 per game (one line for 60p, two lines for 90p and the full house for £1.50). The room only shows in the main lobby of the site for the days that you are eligible to use it. Wink bingo welcome their first-time registrants to the site with access to the newbies room for three days after you sign up with the site. In those three days, there is a total of £900 in bingo bonuses to be won and it can be accessed from both your mobile and desktop. Jackpots in the room vary and could be £5 in bingo bonuses or a selection of loyalty points are given away (either 1,000 or 2,000 prizes). These can be exchanged for bonus funds at an exchange rate of 1,000 for £1 in bonus. 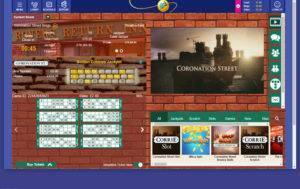 The Sky bingo room was open to new players who had registered with the site and created a chat username. The room was available from 5pm until 9pm daily and was available for the first 7 days. The games in the room were a mixture of free games and pay to play games with the no cost games available on every other game. They were Roll On or BOGOF games. Each of the games had a total prize pool of £10 and this was paid into your bonus account if you were lucky enough to be a winner. However at present this is not a feature that Sky Bingo offer anymore. 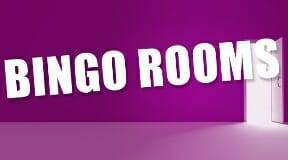 Sun bingo have named their newbie room the learner room and it is available to players for seven days from the point of registering with the site. There are two sessions every day and these run from 11am until 1.59pm and then again in the evening from 6pm until 7.59pm. The room is hosted and gives players the chance to see just some of what the site has to offer without spending a penny. The first site to ever offer free rooms that were open 24 hours a day, seven days a week was Cheeky bingo. It wasn’t long after this that it became more than just a novelty, but an expectation. As the first site to ever offer free bingo all day, every day, Cheeky bingo set a precedent for many brands that launched in its wake. Players at the site are given access to free rooms from the moment that they register with Cheeky bingo and as they rise through the various loyalty levels, more free rooms become available. In addition to this, a redeposit will give you access to additional free rooms with bigger jackpots. Hot on the heels of Cheeky was Costa and this brand offers free games in abundance across a variety of different bingo rooms. Head to the main lobby and you’ll find a dedicated tab for the no cost bingo rooms called Fun & Free. Like Cheeky, the site offers different rooms with various jackpots. For the Newbies who have made their first deposit, there is 72 hours access to a bingo room that has free games for £15 jackpots. For the re-depositors, there is a £500 free play bingo room with a £500 jackpot to be had daily. The free bingo rooms at Gone bingo work in a different way to those at sites under the Cassava hat. Whilst freebies are available daily from just gone midnight until 7pm, these games are just ‘challengers’. 10 tickets is the maximum you can have in these games and the prizes are 50p per line and a ticket for Level 2 games. The level 2 games are ‘premiership’ in the free bingo rooms and play from 8pm until midnight. Tickets can be purchased to the games at a cost of 10p each if you haven’t leveled up and the prize money is £2. For the free bingo rooms at bet365, think super free bingo! Every day the site hosts no cost games in the super star bonanza room for players who have funded their account. The room is open for an hour from 1pm and then again for two hours in the evening, from 7pm until 9pm. You can play for free in this room or opt to upgrade your tickets to super free and increase the prize pot – not only in monetary value but also from bonus to cash. If you opt to play for free, winnings are credited to your account as bonus funds. The free bingo rooms at Lucky Pants bingo are part if the reward scheme the site has to offer. All players start as Newbies but as you rise through the ranks of bronze, silver, gold, ruby and emerald, the more free games you have access too. As a bronze player for example, you can play in a free bingo room every 30 minutes from 10am until 10pm for jackpots of between £2 and £5. Additionally, at this level you can play a free daily game at 9pm for a £50 jackpot. VIP Rooms vary from site to site but predominately are linked to the VIP reward scheme for players. You may find when you visit the free bingo section of a site that there are some games you cannot access until you have reached a certain level in the VIP program. 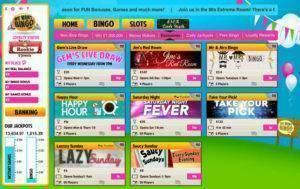 At 888Ladies, and all the associated sites from the Joy Of Bingo Network, VIP Rooms are available when you reach a certain level in their Joy Gem VIP Program. From the main lobby you can see a dedicated tab called Royals and VIP. The Royals covers the rewards for being loyal and the VIP’s, the games for those that have made recent deposits or who have reached certain levels in the rewards program. The VIP Room at Zingo Bingo is also part of the loyalty package that the site lays on for its players. The special game plays on the 1st Saturday of every month for all of the VIP players (Bronze, Silver, Gold and Black) and tickets cost £1 each. The jackpot is guaranteed at £500 and tickets are available to pre-buy. In addition to the big money game, there is another VIP Room at Zingo Bingo and it offers free bingo. There is game every six minutes from 10pm until midnight daily and the prize money per game is £5. For the bgo Bingo players the VIP rooms at the site offer an array of free games. Some of these are daily, but for the big money game when you reach the highest level, it’s once a week. The higher your rank in the Candy Club, the more VIP rooms you can access. Your loyalty level at the site also determines access to the VIP rooms at Kitty Bingo. Newbies do not get any access to the rooms but as soon as you achieve the level of Bronze, the VIP rooms offering free games become accessible to you. The rooms boast daily free jackpots, and the jackpots increase in line with the loyalty level that you have attained at the site. With a selection of different VIP rooms all boasting variable free jackpots, it’s worth being loyal to take full advantage of what is on offer. If you’re a Foxy Bingo player, you too are given access to VIP rooms as part of the VIP scheme that this popular brand has. You are also granted access to the VIP room chat! Foxy have 3 loyalty levels, silver, bronze & palladium. Each will get you access to weekly VIP bonus games, free nightly games with cash prizes and more. Private rooms are found at sites that are part of a network. For many brands that are part of a larger network, the ability to offer a private room means they have the opportunity to offer exclusive promotions and interact directly with the players who have registered with their site over the others on the network. The private rooms will have fewer players and therefore offer an increased chance of winning. Iceland Bingo is part of the larger Dragonfish network but whilst it offers all of the same rooms as others on the same network, it also has a number of private rooms. The Freezer is one of these and opens daily from 6pm until 8pm with £50 jackpots and Iceland food vouchers to be won. Tickets in this exclusive room are priced at just 1p or 2p throughout the two-hour session meaning it’s great if you are looking for a little bargain from your bingo. Rocket Bingo is an award-winning site that is part of the 15 Network. It is one of the few that offers players a number of private rooms. When you enter the lobby, if you are familiar with the usual layout, then you will notice an additional tab labeled Rocket Freebie. It is in this section of the site that you will find the private rooms and all boast free games so well worth checking out. Of all the sites that we have come across, one of the only to actually use the term ‘private room’ is Bingo.com. They offer their players the chance to earn access to their private room, All Stars, every day and all you have to do is meeting the wagering requirement to get your name on the door. The private room is open from 7pm until 9pm and ticket prices vary from free to £3. The room offers a whole plethora of different games too – BOOF, 1&2TG, Fair For All and Roll On games to name just a few. We Want Bingo is a Dragonfish network site but can also claim a private room as part of the internal network from 8 Ball Games. When you head to the main lobby just look for the ‘Exclusives’ tab under Bingo and you’ll see exactly what they have to offer by way of private rooms at this and other brands from the same company. There’s a live draw every Wednesday, a Red Room, Mr and Mrs Bingo, Happy Hours, Saturday Night Fever, Take Your Pick, Lazy Sundays and a Saucy Sunday to chose from. Themed rooms can be found at many of the Virtue Fusion / Playtech sites and more often than not, the theme will be determined by a popular TV program. In general, a themed room will boast bingo games that have additional chances to win when the full house prize has been won. Gala Bingo is host to many themed rooms one of which is based around the popular TV quiz show hosted by Bradley Walsh called The Chase. Whilst the main game of bingo is the same as a normal 90 ball game, the winner gets the chance to beat The Chaser in a bonus round and increase their winnings. The themed rooms at Gala Bingo are often exclusive to the site and include the likes of Emmerdale Bingo and Coronation Street Bingo rooms. Network-wide there are other themed rooms like Lucky Numbers Bingo. When it comes to themed rooms, tombola is probably the most prolific because all of the games that site has to offer have a theme. There’s Cinco, a game using cards rather than bingo balls, Rollercoaster that pops out bingo balls that fall into rollercoaster carriages to create winners, Pirates that has a theme straight out of a Johnny Depp film, Bandit that uses a one armed bandit for the game play and who can forget Hamster Race? Of all the sites we have listed in the themed rooms section, tombola is the only one that isn’t part of a network. At Comfy Bingo and other sites on the Cozy Games software there is a themed room that is called the Wizard of Bingo. It’s billed as a tournament room and hidden away from the main lobby but if you’re looking for something different from your average bingo, it’s worth a play. The theme reminds us of the Wizard of Oz and features Ruby Slippers, a Wicked Witch and a naughty monkey as well as Toto. Each has a different role in the game, some good and some bad. The aim of this game is to be the last person with a bingo ticket to be the winner.